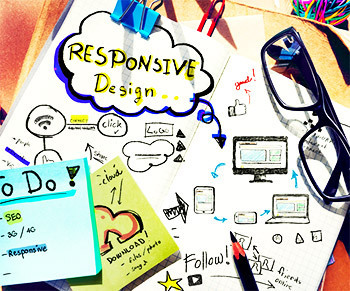 A responsive website is a Mobile Friendly web site. It displays and navigates well on different screen sizes. So on your mobile, there is a single column of content, images are resized, there is a click menu for navigation and the phone number can be called directly, whilst on your desktop there is a wide layout, multiple columns for text, large images and mouse roll-over navigation. The tablet has an in between experience. The website recognises the viewing device and adjusts the website content accordingly. Firstly, with mobile usage of the internet rapidly increasing each year, you are doing your customers a favour. It is much easier to navigate a mobile-friendly website on a mobile device, so customers are likely to stay on the site longer and complete their enquiry or their purchase. Secondly, Google likes to give its searchers the best experience possible. When you Google a topic on your mobile, a mobile-friendly website will be shown in the results ahead of a website that is not mobile-friendly. Therefore, if your website is mobile friendly and your competitors isn’t, yours will show up in the search engine and theirs won’t. Is there a choice? NO! All our new website builds are for mobile-responsive websites. It is that important. There are 21 million smart phones in Australia in 2016 – that’s a saturation of 96%. There is no going back – make your website mobile-friendly!